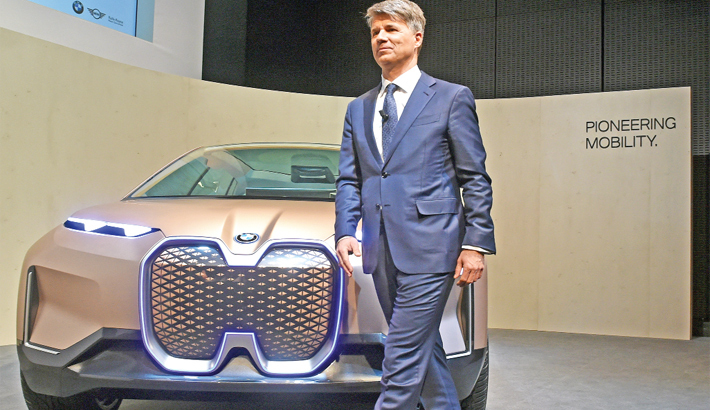 Harald Krueger, CEO of German car maker BMW, walks past a BMW i car before a press conference to present the group's financial results for 2018, in Munich, southern Germany on Wednesday. Women outside a shopping mall in Riyadh, Saudi Arabia. Saudi Arabia’s annual consumer price index fell for a second straight month in February, signalling a deflationary environment in the Arab world’s biggest economy. Social Islami Bank Managing Director and CEO Quazi Osman Ali poses for a photo with high officials of Islamic Corporation for the Development of the Private Sector during his recent visit at headquarters of Islamic Development Bank (IDB) in Jeddah, Saudi Arabia. Islamic Finance and Investment Chairman Shibbir Mahmud presides over the 248th meeting of the board at its boardroom in the capital on Wednesday. Pran-RFL Group Director Uzma Chowdhury and Asuian Developmasnt Bnak (ADB) Deputy Director General Christopher Thieme sign an agreement at a hotel in the capital on Tuesday.